Our Bankton store in Prestonpans relaunched on Friday 6th July with a long queue of customers waiting patiently in the sun to see their new look store, Big thank you to all our customers who waited. Well done to Jen (Store Manager) and the store team for all their hard work. 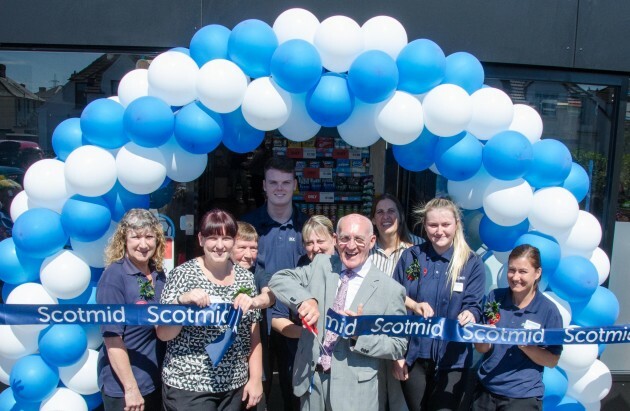 Big thank you to Harry Cairney (Scotmid Co-operative President) who cut the ribbon on the day opening the new look store. Thank you to our first two customers through the door Sean and Stuart who are both regular customers to the store. The whole shop has been revamped with more Food to Go available. The store now has a Rollover (hotdog) machine installed, a Costa machine, Chicago Town Pizza and a slush machine. Still available in store is the bakery counter with a wide range of cakes and savouries available fresh every day. The first 50 customers through the door at 12pm received a goody and a golden ticket. Each golden ticket contained a prize with Charmaine being our lucky 43inch smart TV winner and Laura winning the Amazon Echo. Congratulations to them both.